The best compounds are evaluated for their potential therapeutic activity. In case of our miR-122 inhibitors, we are conducting hepatitis C virus replication studies, since miR-122 was shown to play a very important role in the life cycle of the virus. 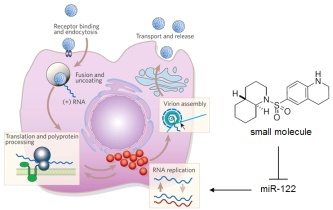 Importantly, our sulfonamide 1 was able to reduce viral RNA loads in human liver cells by 90% and thus represents a fundamentally new approach to the treatment of HCV infection.